Ever wish you could predict where your arrows will land with perfect accuracy? 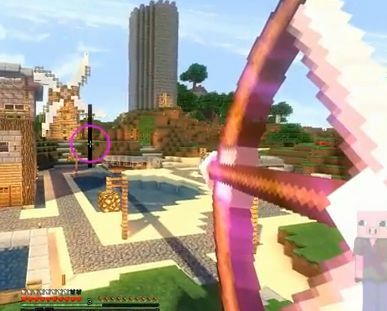 This Japanese mod, roughly translated to “Full Bow Sight”, is a sort of aim-hack for thrown items and bows in Minecraft. Some may consider it cheating, but with this mod you will never have trouble aiming again! In this mode, a black pillar rest on top of where the arrow will land if its flight is uninterrupted. A shadow will be cast across the land leading from the player to the pillar. This is best for close-range use as it does not obstruct the player’s view. This mode displays where the arrow will land on a 3D display. Using this mode is useful for making very long shots. This mode is an alternative version of the one before it, producing the same effect except using a flat 2D map to display the landing zone. The fourth mode is simply the default Minecraft setting – no aid will be displayed. Modes two and three can also be useful for exploring the surrounding area without venturing too far. Each mode has a power gauge as well that displays how much the arrow is drawn back. As this gauge fills, a circle will appear in the center of the screen. Once it is completed, the arrow is at full power. This can be enabled or disabled by pressing the U key. Download the latest version ofFull Bow Sight. Search for 弓の照準MOD on the download page, and choose either the link that includes 1.7.2 or 1.6.4 depending on which version you want. 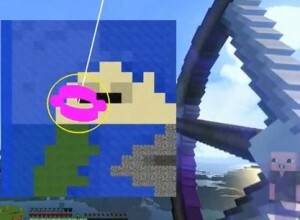 Would you consider this mod to be cheating in multiplayer Minecraft? Why or why not? Leave your thoughts in the comments section below.